Good morning all! I have a double Guest RD post for you guys – Michelle and Amanda have prepared a great sample 2-day vegetarian meal plan to demonstrate that protein needs are easily met with plants. I want to make their Apple Pie Smoothie stat!! Check out their blog – Life To Table – for more great recipes and tips. Hi everyone, it’s Michelle here! As a registered dietitian in the women’s health clinic, my days are spent with a lot of prenatal and post-partum women. I even get to spend some time with 6 week old beautiful newborn babies who too often pass gas in my hands while I am assisting baby and mother in feeding or spit up on me after they have finished a good meal J (I don’t mind, they are so cute! And seriously, who knew noises like that can come out of something so tiny?!) I have learned so much working with prenatal patients contrary to what I thought I knew. For example, not every woman craves pickles with ice cream, every pregnancy experience is different, and you most definitely can follow a healthy, nourishing vegetarian diet while pregnant. Protein needs for prenatal women are greater compared to women who are not pregnant. A general rule of thumb is ~70 grams of protein per day (about 1.2 grams – 1.4 grams of protein per kilogram of body weight) however this figure can vary depending on height and/or previous and current health conditions , so be sure to check with your doctor or dietitian for a more custom tailored estimation. It is this fact that usually sends a vegetarian mom- to- be in a kind of panic mode and starts to fear that she may not be nourishing herself and her baby appropriately with a plant based diet. I have seen some crack, give in, and start eating meat despite their genuine desire to continue to eat a vegetarian diet. A lot of this fear can also be attributed to societal pressure and from your own personal support group. I know everyone has that one family member or friend who always exclaims, “You don’t eat meat? Are you like, on a diet or something?”…they just don’t get it and they certainly will not get it now that you are supporting yourself and your growing fetus. Together, myself and my blog partner/fellow RD/ best gal pal Amanda have developed a sample 2-day vegetarian meal plan consisting of ~70 grams of protein per day. (Please note: It is my professional recommendation to supplement your diet with a prenatal vitamin and speak to your RD about any specific food allergies or aversions to ensure you are getting all of your recommended prenatal micronutrients). Cook ½ cups of oats in 1 cup of low fat milk, add peanut butter and cacao powder and mix it around to combine. Top with ¼ sliced banana. Layer a 6 ounce cup of Greek yogurt with chopped fruit and granola. Measure ½ cup of diced firm tofu, then finely dice. Sautee in pan: finely diced tofu, peppers, mushrooms and onions for ~5-7 minutes; use spices like cayenne pepper, chili powder, cumin and garlic powder to give it a yummy Mexican-type flavor. Add tofu and veggie scramble to a whole grain tortilla wrap, top with ½ cup of black beans and ¼ of avocado. ½ cup of cottage cheese; 1 cup of berries or fruit of choice, 1 TBSP of honey. ¼ cup of uncooked quinoa, 1 cup of chopped kale, 1 cup of halved roasted Brussels sprouts , 1 cup of roasted mushrooms, ¼ cup of crushed cashews, ¼ cup of balsamic glaze drizzle (or dressing of choice). Cook quinoa according to package directions. Toss Brussels sprouts in olive oil, salt and pepper, roast in a preheated oven at 400 degrees Fahrenheit for ~20 minutes. Ten minutes before, add the mushrooms, toss, and finish cooking. Meanwhile, massage kale with olive oil and dash of salt for a couple of minutes to soften it up a bit. Combine cooked quinoa, kale, roasted Brussels sprouts and mushrooms, crushed cashews and choice of dressing. If you have a good blender like a Vitamix, process the apple until it resembles applesauce. If not, just use applesauce :-). Then add the rest of the ingredients and blend until smooth. Edamame can be purchased frozen, and is so simple to prepare! Just boil them in water for 5 minutes, and quickly place into ice cold water to stop the cooking process. In a Dutch oven or pot heat the olive oil, then add the onions and garlic. Add lentils, tomato sauce and water. Bring to a boil then reduce to medium heat. Cook for around 30 minutes until your lentil mixture thickens to your liking. Next step is to assemble your tacos and enjoy! Add almonds and cashews to a food processor and blend until it becomes a meal ~30-45 seconds. Add pitted dates, melted coconut oil, cacao powder, hemp protein powder and blend until smooth ~30 seconds. Eat on the spot or store in an air tight container in the fridge for a few days. 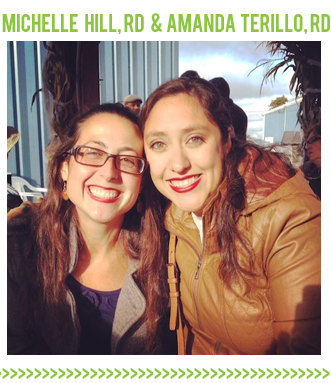 Michelle Hill and Amanda Terillo are two registered dietitians, best friends and bloggers who both graduated from Long Island University- C. W. Post in Brookville, NY with a Bachelors Degree of Science in Nutrition. They both mostly follow a plant-based diet, as they believe that it provides one with an abundance of vitamins, minerals, protein, healthy fats and fiber, which are essential to sustaining the healthiest life possible. Michelle (right) works as an outpatient Registered Dietitian and a Certified Lactation Counselor for a Women’s Health Clinic in NY. When not working, she is blogging, crafting or cooking up a (messy) storm in the kitchen. Amanda (left) works as outpatient Registered Dietitian at a contract Veterans Affairs clinic in central Virginia and has recently started a consulting business called A Nutritious Life: RD, services. When not working she is with her dogs, hiking, or attempting to garden. Can’t wait to try that apple pie smoothie and lentil taco recipe! Both sound delish! Great! Just note that if using a non dairy milk almond milk does not have any protein. Almond milk has protein. Silk unsweetened original contains 1g per cup. compared to 8 gm protein per cup of cow’s milk. Really need to read the labels on some of the “alternative” milks – many do not contain very much protein, especially if you are trying to ensure adequate protein intake. If you have a severe dairy allergy like me, almond milk’s 1g is all I’ve got. I can’t ingest soy either so my options are limited. The nutritional profile pf almond milk is pretty good all around, nutrient-wise, so I feel like this is a good option. This is a great idea for a post! The apple pie smoothie sounds yummy. Michelle, you and I are job twins! I’m the RD for prental clients at a woman’s health clinic in Brooklyn. I am not a vegetarian but I am having trouble eating in general 31 weeks in. These sound good. If nothing else at least I will focus on the banana and peanut butter combo. I hear that often. Some women get full quickly, others get heart burn… It can be tough. I always recommend eating small meals through out the day, but make those small meals count! Pack on the healthy nutrients and foods loaded with a good amount of healthy calories like avocados, nut butters, flax seed oil, coconut oils. Most of these ingredients can be added to smoothies and not even taste them. These days everyone is about protein, protein protein that I think we are used to eating way too much of it and people start questioning if they don’t drink protein shakes or eat meat, whether they get enough. This goes to show there are plenty of other sources in protein in carbs without getting it directly as a pure source of just protein. Thank you! I needed this info so bad. I’m 23 weeks along and still have a huge aversion to meat. I’ll make it for the fam and then end up not wanting it for some reason. I’m also low in iron which I know would go up if I ate more meat, but I can’t bring myself to do it. This was very helpful and I can’t wait to try out some of these recipes. Lentil tacos have always been one of my favs, but I haven’t done it in forever. Great reminder! Hi Hannah! Iron is best absorbed with citrus foods. For example if you have some dark leafy greens try pairing it with foods like tomatoes or oranges. Iron and dairy products that contain calcium compete for absorption so avoid having iron foods and dairy products together. I love the meal plan ideas! I try to eat plant-based as much as possible, but sometimes worry about getting enough protein, especially with snacks. Though I’m not pregnant, I’ll be incorporating some of these ideas into my diet. Thanks! This post could not have come at a better time for me! At 18 weeks pregnant meat has become one of my biggest turn offs! 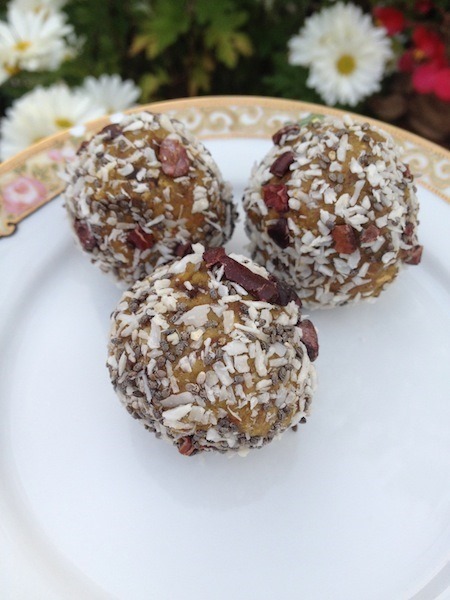 I can’t wait to try the Chocolate Protein Bliss Balls! 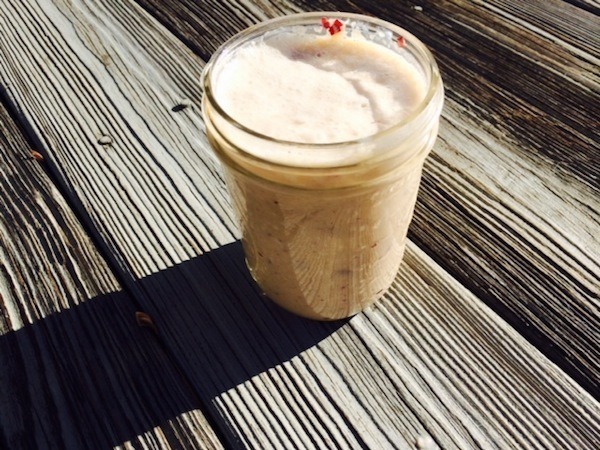 The Apple Pie smoothie looks delicious too – I’m not big on tofu/soy though, would Greek yogurt be a comparable substitute? Hi Lindsey, congratulations!! I have not tried it with Greek yogurt but I definitely think it would taste great! I use Greek yogurt in practically everything! I would recommend plain Greek yogurt instead of a flavored one. I’m 10 weeks pregnant and just ran across an article last night that mentioned how much protein pregnant women need. This article came at a great time! I had greek yogurt with strawberries and kiwi for breakfast, cottage cheese with a pb&j on whole wheat for lunch and a chicken chili for dinner (with a little cheese and sour cream on top). Hopefully I came close to 70! Excited to see a veg post! Happy New Year! This is a great post. Its so helpful to see a full meal plan. It helps to better understand what types of foods you should be incorporating into your diet.